If you want to learn more about Hinduism, then scroll up and click “Buy Now”! I have been studying Hinduism for a few months now, and i love having this book around. Helps answer some questions other books cannot and added to my learning experience. It was very simply worded and was perfect in explaining key terms that would be otherwise hard to understand in other books where the author assumes the reader already knows these terms. I would recommend this book to anyone who wants to learn about Hinduism. I really enjoyed this book. As someone who is very clueless about Hinduism, I do wish it had been a bit more in depth and would have loved some hindu legends (which it does not cover) but it was a good primer. Some chapters and ideas contradict each other. Writer tries to justify everything prevalent in hindu society with an analogy, which does not match with religion sometimes. It is amazingly comprehensive for as short as it is. It is well-written and conversational in style. I have recommended this book to many friends that are curious about other religions and cultures. I found them sorely lacking, unless I wanted to learn Sanskrit and plow through all of the original script. This book was a wonderful overview of the religion within the context of cultural understanding. It gave not only the basics of the religion in theory but also great insight into how it is practiced. Informative book about Hinduism. Great for a beginner or someone just wanting to understand Hinduism better. Very clearly written explanations and detailed but brief. A very good on the basics of Hindu Religion. Excellent book on Hinduism for both novices and practicing Hindus. Highly recommend this book for anyone and everyone who intends to know more about Hinduism. This is also the first book I ever encountered on Hinduism, and to be perfectly honest, it's not very hard to understand. The information is precise, the narrative flow is never complex, and the visuals are lovely to look at. 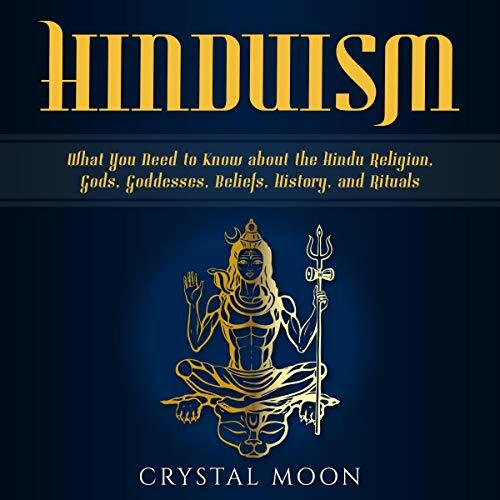 And although there are a few words here that need to be looked up in the dictionary, "Hinduism: What You Need to Know About the Hindu Religion, Gods, Goddesses, Beliefs, History, and Rituals" is still a fantastic audiobook. Highly recommended for those who are interested in the world's oldest religion, or in Indian culture in general. This is a very good introduction to Hinduism written by a Hindu scholar and spiritual guide. It isn't too complicated for beginners but at the same time provides enough details for the intermediate reader. Well written summary of major points of the world's oldest religion. Sufficiently comprehensive without being overly pedantic or evangelistic. This author provides an essential outline of Hindu culture and religious practice. The explanation of karma, reincarnation and other esoteric aspects of the East are well developed and presented. A very enlightening audiobook. The books live up to the praise that the blurbs on the back of book. I suspect Hinduism has many more dimensions, more depth than I had originally expected for it. I know this sounds like crass chauvinism but I often wondered how a country so old as India had so much suffering and poverty. The author did a fantastic job at painting a worldview for me, a westerner, to understand the Hindu faith in a way that I would not have if I had simply picked up a copy of the Bhagavad Gita translated into English. I admire his work and have listened to many different parts three or four times, because each time something else stands out to me in a different way. It has truly changed my life. The important thing this book states is that Hinduism is a way of life and not just a practice. It integrates all aspects of one's life. The book explains and clarifies the importance of River Ganges, cows and Brahman, of which many people are misinformed. Over all this book is excellent although I did notice one or two items that may be opinion. However as someone who has embraced Sanata Dharma as an adult, there was much knowledge to be had and I learned a few things. The section on how the Gita is divided was especially helpful as were festival information. Very well written and explains a religion that I had not fully understood in an enjoyable read. I thought this was excellent as it brought to life the various facets of this interesting religion. This would suit most ages as it is written in a clear style with chapters covering a broad range of the Hindu religion.